I've devoted a couple of posts lately to the disparity between what liberals presume the state of public opinion should be in light of facts on the ground and what it appears really to be. You might have thought, first, that, while we're still reeling from the Wall Street-induced financial crisis of 2007-8, ever larger numbers of people must be thinking that they have more to fear from big business than big government. Alas, that appears not to be case. And you might have thought, second, that with unemployment at 8.6% and with Occupy Wall Street and all, that people would be a lot more distressed about growing inequality in the distribution of wealth and income than they appear actually to be. Something similar seems to be happening with respect to foreign policy as well. Four or five years ago, when occupied Iraq was descending unmistakably into civil war, it seemed safe to say that people across the political spectrum we're beginning to agree that invading Iraq had been a dreadful mistake perpetrated by an administration that didn't know what it was doing. Even a lot of the people who backed the troop surge in late 2007 and early 2008 on the theory that it was too late to turn back seemed to be thinking along these lines. As I recall, most them weren't still putting up much of a fight if you suggested that we'd have been better off trying to contain Saddam going forward than getting rid of him back in 2003. Put questions of the intellectual merits of the liberal worldview aside for the time being and concentrate just on its popularity. If you'd have asked me after the 2004 election to design a scenario most likely to enable liberals to score ideological points with respect to both domestic and foreign policy with the American public, I don't think I could have dreamed up anything much better than what we've actually experienced between, say, 2005 and 2009. Of course, I would have posited a robust economic recovery starting in early 2009 and extending indefinitely into the future. But liberals can't have everything, especially when the economic doldrums we're now experiencing are being felt across the industrialized world to the detriment of center-right and center-left governments alike. I confess that, even had I known how tepid our economic recovery was going to be, it still would never have occurred to me that liberals would be losing this much ideological ground with the American public. This chart is amazing. It is certainly not what I would have expected. The funny thing is that I always thought that the Iraq decision and George W's presidency overall will have to be viewed in retrospect a decade or two down the road to really get a sense of it. I wouldn't be surprised if history looks kindly on both. 1. That the invasion of Iraq was immediately popular, but over th following years, it lost about 60% of it's supporters. This is intuitive, and I think it is widely expected. 2. That it has gained about three or four points in support (by my eye) over the last three years (and as the memories of IEDs, American troops, and the polarization of the Bush era fade). Once again, this seems intuitive, and to be expected. So what, precisely, is the suprising part? 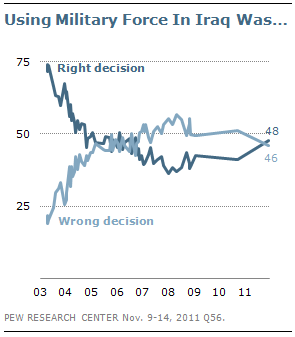 To me, I'm surprised that, as of 2011, more people polled think that using military force in Iraq was the right decision than those who think it was the wrong decision, in light of the anti-war sentiment since WMDs weren't found. Even after electing a liberal president who was staunchly against the war in Iraq, more people now think it was the right decision. Apparently Ron the blogger thinks the results are surprising too. So I really don't think the recent results in 2011 are all that intuitive and can be explained by fading memories. I think there is more to it. The surprising part is that, in liberal circles, the decision to invade Iraq wasn't just a tactical and strategic misstep. It's still emblematic of Bush's stupidity and neo-conservative immorality. The once thriving species of liberal hawk is now extinct because once hawkish liberals have either done their penance (Clinton, Biden et al.) or been summarily excommunicated from the liberal community (like Hitchens). I don't know about you, but Obama's election had me thinking that the liberal view of Iraq had prevailed in the nation at large (at least to the point of winning over the median voter). But, if the Pew poll is to be believed, a near majority of Americans now believe not only that the war was morally responsible, but that it wasn't even a strategic misttake. Indeed, if you click on the link, you'll see data suggesting that most Americans think of it as a successful, if costly, mission. Maybe I'm naive, but that surprises the hell out of me given what people were saying a couple of years ago.